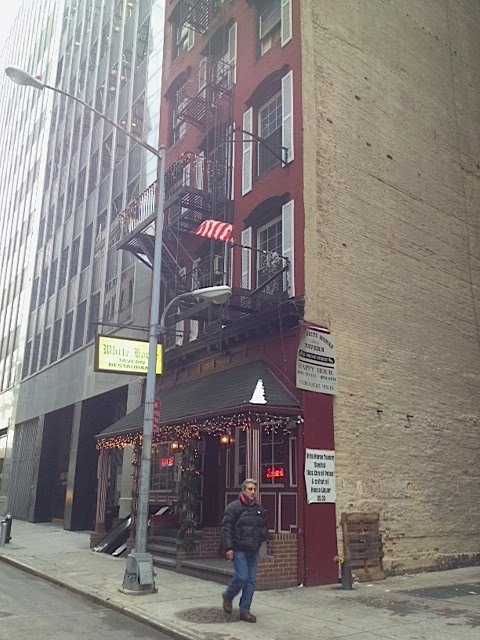 Everyone knows the White Horse Tavern on Hudson Street, the century-old-plus haunt of writers, singers and anarchists, last drinking spot of poet Dylan Thomas, etc. Fewer know of the city's other White Horse Tavern, dive-ish hole in the wall on a nothing side street on the southern tip of Manhattan. The latter White Horse is situated in an old, five-story brick building at 25 Bridge Street. There's nothing surprising about there being two White Horse Taverns in New York. White Horse is the name of a blended Scotch whisky that was extremely popular in the middle decades of the 20th century. The White Horse is a survivor, a lone old-world structure surrounding by glass towers. I don't know who owns the bar, but I have to believe they also own the building, because there's no other explanation as to why the bar still survives, given the valuable land it occupies, and the low prices it charges. There are reports of a five-story building being here as far back as the 1870s. Whether it's the same five-story building, I don't know. There was a fire here in a "fancy bag factory" in 1891. It was owned by Jefferson M. Levy until 1904, then the City owned it for a spell, until selling the property to William B. Gottlieb in 1916. The City somehow came into possession of it again, and sold it to George W. Butler in 1930. An electric sign application was filed in 1928. There was a restaurant here as early as 1962. It don't know if it was the White Horse, but I can't imagine a tavern calling itself that unless it was founded in the mid-20th century when that brand was king. My guess is the White Horse has been here since Prohibition was repealed. The wooden bar is long and, judging by the wooden cooler cabinets in the back, quite old, dating at least to the 1940s. The White Horse gets a varied clientele. You'll see Wall Street suits and blue collar hardhats. The prices are extremely cheap, both for the drinks and food. (Yes, you can eat here.) You can get a shot and a 16 ounce PBR for $5, and a soup and salad lunch for $8. It has crazy weekday hours—opens at 8 AM and doesn't close until 4 AM. It does close on Sunday. Great find! Will have to try it out soon. Glad to have you back by the way. PBR? Looks like the hipsters have discovered this joint. I am quite happy to see you back with such a vengance. And I am glad you've pointed me at this place. I like this place - so unpretentious and friendly! The food is basic pub fare but the variety of beers and ales is very good and interesting. The service was good, the booths comfortable and the clientele represented all ages and dress -- not just Wall St. jr. execs. My husband and I had the brisket and wonderful fried cauliflower. My friends had fish & chips. We had a lovely dinner experience. It looks very old, sort of turn of century, but I think it's from the 40's. If you're at the Battery, come here and you won't be sorry, and won't feel ripped off like many of the newer yuppified places. Who the Heck Is Wallace?